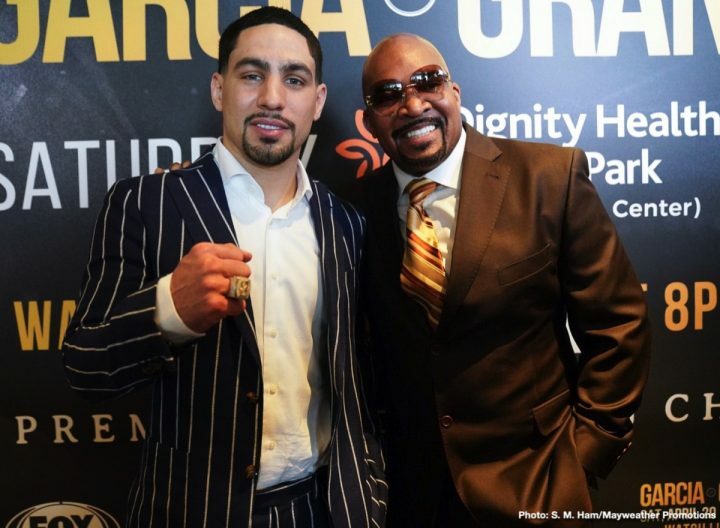 By Chris Williams: Danny Garcia says he knew Errol Spence Jr. was going to beat Mikey Garcia the moment the fight was put together. It was a no-brainer in Danny’s mind that IBF welterweight champion Spence (25-0, 21 KOs) would hand Mikey (39-1, 30 KOs) his first career defeat last Saturday night due to him being so much bigger than the 5’6″ lightweight. Garcia (34-2, 20 KOs) will be taking a stay busy fight next month against Adrian Granados (20-6-2, 14 KOs) on Premier Boxing Champions on Fox at the Dignity Health Sports Park, in Carson, California. Although this is supposed to be a tune-up/confidence booster for Garcia, it’s not certain that he’ll win. He’s lost 2 out of his last 3 fights, and no longer looking like one of the elite fighters in the welterweight division. It’s true the bigger name beat the smaller man in Spence, 29, defeating Mikey, who was coming up from the lightweight division to take the fight. The boxing fans wanted to see the Spence vs. Garcia fight. Errol gave the fans what they wanted to see by defending it against Mikey. You cant blame Spence for giving the fans a fight that they felt was interesting. Danny Garcia, 30, needs to take notes from Spence and Mikey by stop wasting time with tune-ups, and focus on facing the best. Spence has wanted to fight Danny for ages, and he’s never gotten the fight with him. “Definitely, I want all the bigger fights after this one,” Garcia said when asked if he wants to fight the likes of Spence, Shawn Porter, Pacquiao and Keith Thurman. “I think fans want to see certain fights. It’s not that they’re bigger stars. That’s just the fight that the fans want to see,” Danny Garcia said in trying to explain why the boxing fans were so excited at seeing the Spence vs. Garcia fight. Danny want the bigger fights, but Spence likely isn’t one of the guys he wants to fight. Garcia specifically mentioned wanting to fight Pacquiao, and Thurman and Garcia. Garcia lost to those last two names, and he says he wants to avenge the defeat. Garcia is likely going to get a chance to fight Thurman and Porter again, but it’s improbable that he’ll win those fights. “I just got to go in there and follow the game plan, and fight a smart fight, fight my fight, dictate the pace, do what I want to do in the ring, and just get this victory,” Garcia said to Fino Boxing about his fight with Granados next month. Granados is going to be a hard fight for Garcia. Shawn Porter had all kinds of problems in beating Granados by a 12 round unanimous decision in November 2017. Porter usually mugs hi opponents, but against Granados, he was forced to box him for 12 rounds, because he was getting hit so much. The judges still gave Porter the victory by a fairly wide set of scores [117 x 3], but it still very competitive fight. In Granados’ fight before that, he lost a controversial 10 round split decision to Adrien Broner in his hometown of Cincinnati. “I definitely want revenge. For my legacy, and for my personal peace,” Garcia said about about wanting to avenge his loss to Shawn Porter. Garcia will probably get his rematches with Thurman and Porter, but that doesn’t mean he’s going to win the fights. If Garcia loses to both of those guys again, he’s going to have to look in the mirror and make a decision what he wants to o with what’s left of his career. Garcia can probably move back down to 140, but that doesn’t mean things will be any better for him in his old weight class at light welterweight than what it’s been since he moved up to 147 in 2014. Garcia hasn’t shown he can beat the quality fighters. He lost to Thurman and Porter. Those are the only guys Garcia has fought at 147. Garcia’s wins at welterweight has come against these fighters: Rod Salka, Lamont Peterson, Samuel Vargas, Robert Guerrero, Paulie Malignaggi, and Brandon Rios. “Definitely, he’s a legend,” Garcia said about wanting to fight Manny Pacquiao. “He’s the biggest payday. He does the biggest pay-per-view numbers. A fight with Manny Pacquiao and Floyd Mayweather Jr., I always wanted to fight those guys. Fighting Manny Pacquiao would be a dream come true,” Garcia said. It’s entirely possible Pacquiao might fight Garcia at some point, but probably not if he loses to both Thurman and Porter first. There would be no reason for Pacquiao to bother with Garcia if he lose to both of those fighters. Pacquiao wants to fight the best, and Garcia clearly isn’t that kind of a fighter at welterweight.